The Mask and The Mirror, an exhibition of self-portraits curated by artist Shirin Neshat, will be on view at Leila Heller Gallery in Chelsea from November 3 through December 21, 2011. The exhibition will take place in the Gallery’s new space at 568 West 25th Street and will present photographs and paintings by 17 artists—some internationally iconic, others emerging and on view for the first time in New York—from the United States, the Middle East, Africa, and Pakistan. An!illustrated catalogue will accompany the exhibition. The Mask and The Mirror will include work by Marina Abramović, Matthew Barney, Paolo Canevari, Feridoun Ghaffari, Ramin Haerizadeh, Lyle Ashton Harris, Y.Z. Kami, Shahram Karimi, Robert Mapplethorpe, Youssef Nabil, Nicky Nodjoumi, Bahar Sabzevari, Cindy Sherman, Shahzia Sikander, Iké Udé, Van Leo, and Andy Warhol. Among the highlights of the exhibition are a photograph by Matthew Barney, Drawing Restraint 13: Instrument of Surrender, 2006, with the artist in full military uniform flanked by soldiers, and an untitled color print by Cindy Sherman from 2000 in which she is wearing a yellow wig and outlandish clown makeup. Also included in the exhibition are photographs by Van Leo(1921-2002), whose Hollywood-inspired images of Cairo’s belle époque are considered unrivaled in the Arab world. "As a Middle Eastern artist with a history of making self-portrait photographs, I have been interested in how the West has influenced non-Western cultures and our way of capturing identity and expression of self," notes Shirin Neshat. 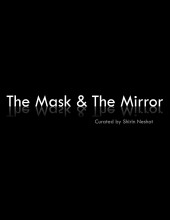 The works in The Mask and The Mirror fall into two categories. Some of them are self-portraits that mask identity while remaining autobiographical and functioning as a form of self-examination, exploring the artist’s personal emotional, sexual, and psychological angst. Other self-portraits serve as social commentary that mirrors pressing cultural, political and religious issues in the world the artist inhabits. In both forms, though, the artist learns to wear disguises, perform roles, and reflect society. “I was particularly inspired by the parallels I found between the work of Egyptian photographer Van Leo and American artist Robert Mapplethorpe, as both artists photographed their bodies with similar sense of obsessions and results," said Neshat. Shirin Neshat was born in Iran. She is well known for her work in film, video, and photography, which has been shown at major museums nationally and internationally. Her film Women Without Men won the Silver Lion for best director at the 2009 Venice Film Festival. She lives and works in New York City.